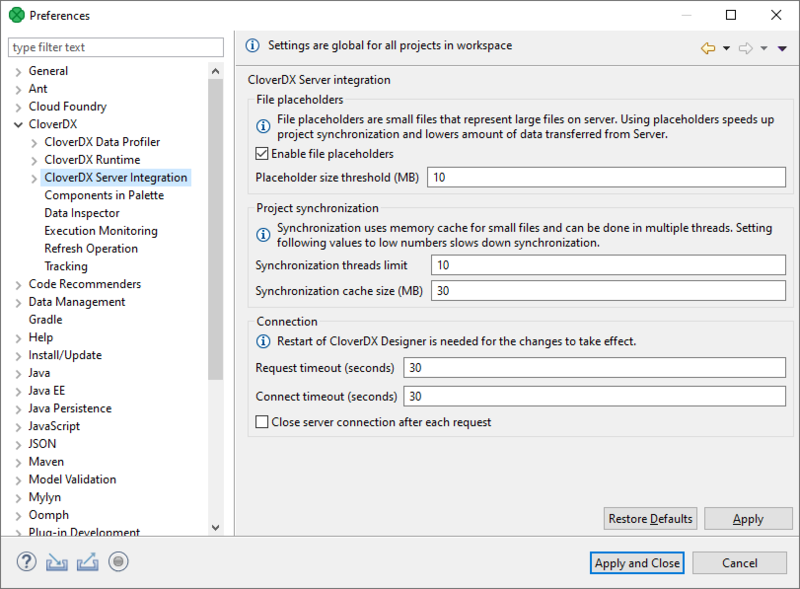 Preferences of CloverDX Server Integration allow you to tweak communication between Designer and Server. Enables usage of placeholder files. The placeholder file serves to save your disk space and to speed up synchronization in server projects. The files with a size above the specified limit are replaced with placeholder files (in Designer). Usually, you do not need to see the content of these files and you do not commit them into repository. See CloverDX Server Project. Files above this threshold are replaced with placeholder files. The size is in MB. The maximum number of threads used for synchronization between CloverDX Designer and CloverDX Server. Using more threads can speed up synchronization in networks with high latency. While downloading files from CloverDX Server during synchronization, the content of files is cached in memory to improve the performance. This parameter sets the cache size. A request timeout of connection to CloverDX Server. The request timeout is in seconds. Timeout of the connection to CloverDX Server. The timeout is in seconds. Enables closing the connection to the server after each request. Used for performance tuning in old (RSE) projects. Restart CloverDX Designer to use new timeout values.